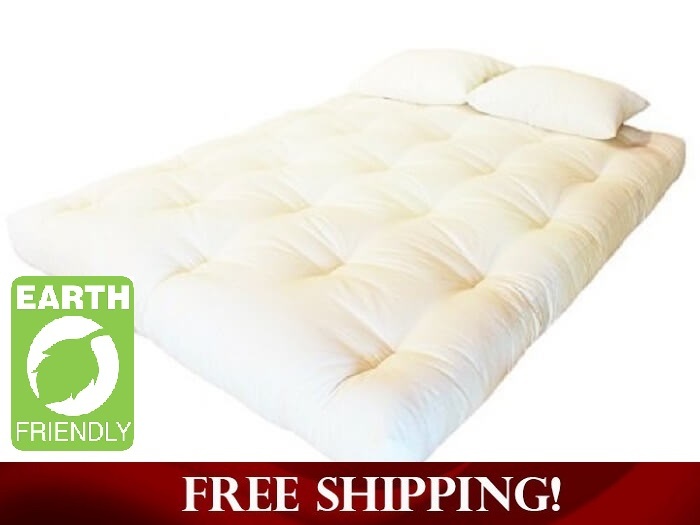 Looking for an Eco-friendly Foam Core Mattress with No Fire Retardants? You found it! 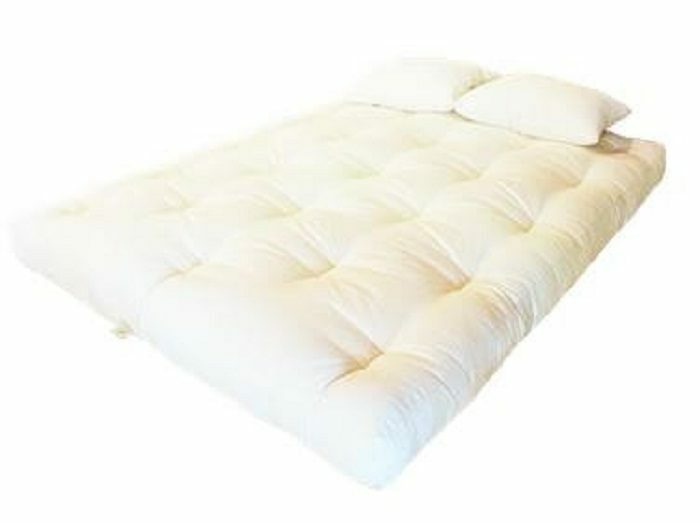 This mattress is made from Clean Green Cotton, Unprocessed and Untreated, that is then encased in a Natural Wool Barrier. For additional Comfort, this All Natural Mattress has an additional Foam Core made of “Evergreen Foam”. This Natural Mattress delivers a bouquet of Eco-Friendly materials to show you “Green” at its finest. 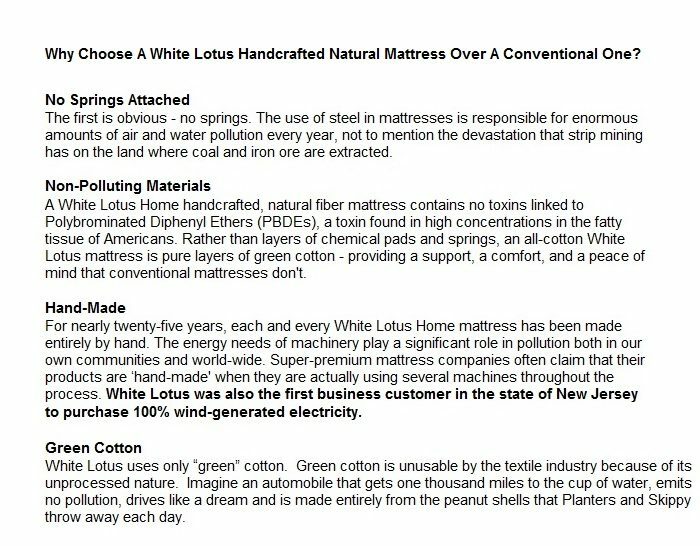 This White Lotus Mattress is one made up of pure layers of Green Cotton rather than layers of chemical pads and springs. 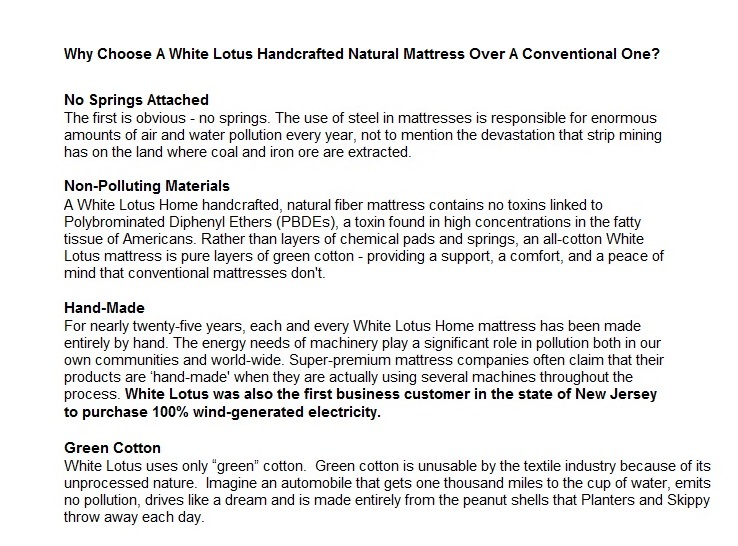 This mattress uses only “Green” Cotton (no poly pad fillers, unidentifiable materials, or “cotton-like” substances). Green Cotton is unusable by the textile industry because of its unprocessed nature. Unprocessed like uncertified? No, not quite. The mainstream bedding industry requires over processing and chemical treatments to maintain safety compliance and competitive pricing, and White Lotus has found a way to escape the toxic loop. With the heightened awareness that some manufacturing practices are not good for us or the environment, White Lotus brings forth a solution. In this mattress they’ve used Green Cotton. “Green” is often used in the same way as “Eco-friendly”…So what does it mean? It means that either a product or way of living does not have a detrimental effect on the environment. In this case, the product is made from excess clean cotton BEFORE it’s been treated, thereby not harming you or your loved ones with chemicals. And because White Lotus is using excess materials that would otherwise be wasted, the process is conservative and reverent of our earth-provided materials. Admittedly, the term “foam” is usually subject to high criticism because of its relation to petroleum products and the terrible side effects of manufacturing such products. Thankfully, companies like White Lotus and Savvy Rest know how to maneuver through the confusing world of foam. White Lotus’ Evergreen Foam uses a combination of natural oil‐based and conventional polyol, and polyol is made from plant‐based oils from plants such as soy and castor bean. 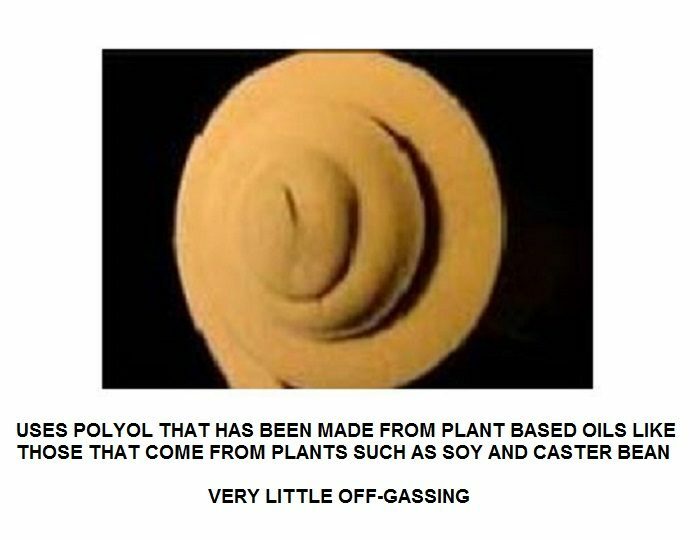 The Eco-friendly result: 60% reduction in use of fossil fuel (every 11 pounds of plant‐based polyol saves a gallon of crude oil) and there’s very little off-gassing. White Lotus has done us all a great favor by making their mattresses in the way that they do. It’s pretty simple. Safety requirements mandate that most commercially made mattresses be treated with a fire retardant. The friendliest of those retardants is Boric Acid. White Lotus has found a way to give you a natural and affordable alternative to the use of chemical retardants, and that alternative is Wool. 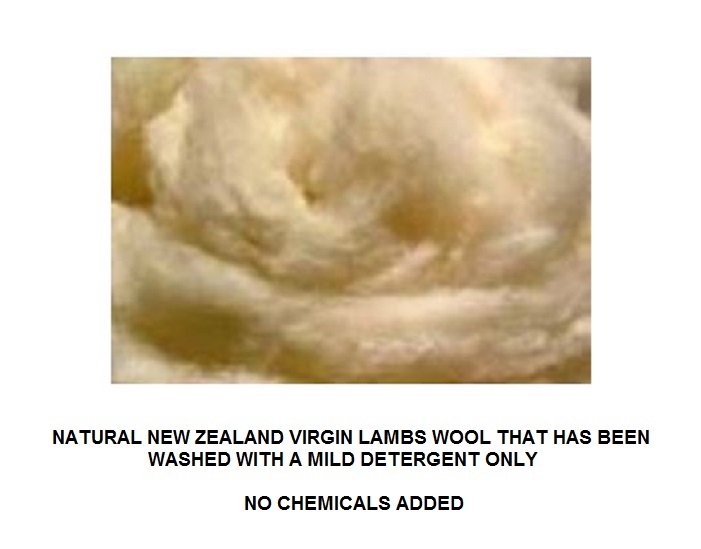 They use New Zealand virgin lamb’s wool that has been washed with mild detergent only-No Chemicals Added. The Wool is All Natural, but cannot be certified as US organic because the sheep are not raised in the US. BUT, we still benefit because Wool is rightfully recognized as an effective Fire Barrier, so it can be used in place of a Chemical Based Fire Retardant (without violating any mandates). We carry mostly the Dreamton Style, and the term Dreamton simply means that the clean green cotton is wrapped in wool, so no chemical fire retardant is used. 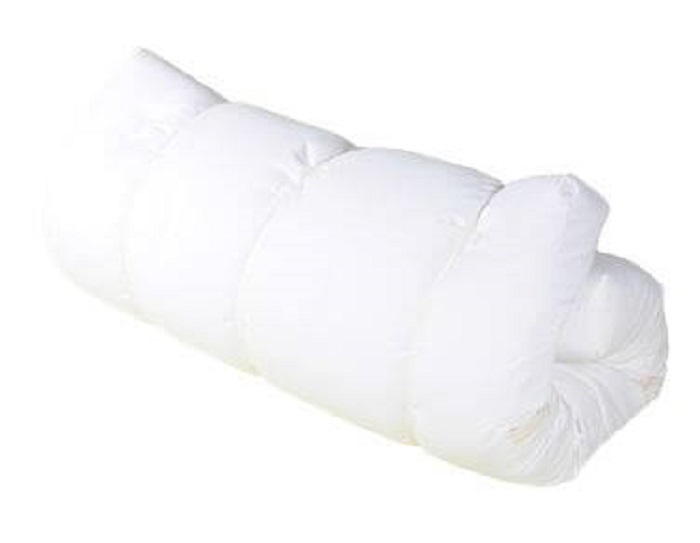 You can get any White Lotus mattress in a Boulder Style, and the term Boulder means that it has more materials and almost double the stitching and tufting, which by default makes the mattress very taught and very firm with little give. If wool is not a desirable material for you, you might consider an All Green Cotton Mattress that can be made With or Without a Fire Retardant (and without the use of wool). 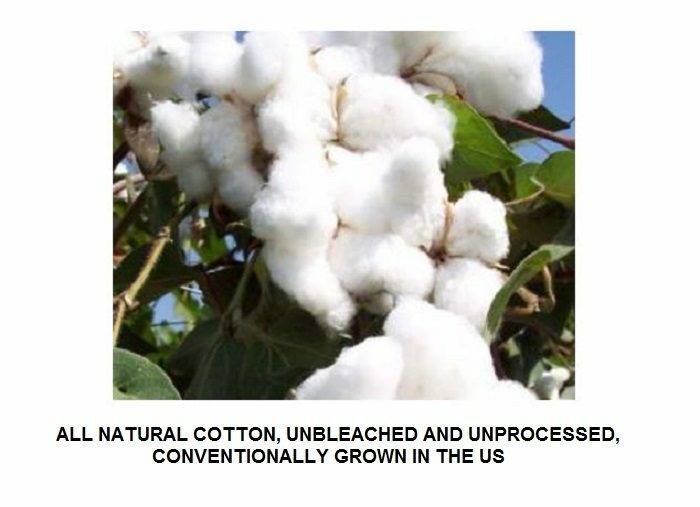 Green Cotton is not certified Organic Cotton. Green Cotton is Eco-friendly CLEAN (chemical-free) cotton that serves as a non-toxic and affordable alternative to the 100% Organic Options. White Lotus has structured their business and their manufacturing processes around reducing the use of chemicals while conserving and revering our natural resources, and we think they’ve done an outstanding job! Sometimes these terms can be loosely interchangeable, but Not with White Lotus products. Mattresses are for Beds, are sold at a baseline 6” Thick (although they can be custom made to be up to 9” thick with an altered price), and have 4 handles sewn onto the side panels for easy moving and flipping. Futons are for Futon Frames, have no side panels or handles, and are sold at a standard 5” Thick (5” thickness is the maximum for futons because they need to be able to bend for the futon frame). Outer Covering is made from 100% Cotton Twill. Put your All-Natural Mattress on a Toxin-Free Solid Oak Platform Bed Frame. And for another alternative at a lower price, check out our Pine Platform Beds. Both are Chemical Free, All Natural Solid Wood and are Proudly Made in the USA!